Last week was the IRONMAN 70.3 CHATTANOOGA triathlon in Chattanooga, TN. Where were you!? I came. I saw. I finished. End of race report…. ok maybe not. There’s a couple of things that happened in between. I headed out from KC the Thursday before… for my 12 hour drive that started after throwing the kids on the bus for school. Being a thrifty racer, I opted to drive with all my gear and stay at a budget friendly BNB 1.5 miles north of the river. I brought all my own food and with the exception of dinner with some friends the night before the race, I avoided costly trips eating out. BUT, along the way, I spotted the below and our good friend Chris that doesn’t seem to get the idea of taking care of your bike. I mean, really? 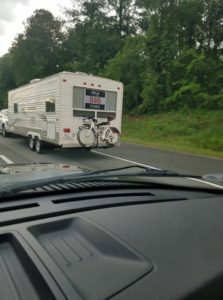 Your bike’s outside on a rack when you have a camper trailer? Bad form. He got some razzing on Facebook for that. I also hung around IRONMAN Village for some announcements and the Pro Panel. One awesome announcement was that IRONMAN and Chattanooga extended their contract for 5 more years for the half and full. The race isn’t going anywhere for a while, and for good reason. Great venue! The pro panel consisted of Andrew Starykowicz, Andy Potts, Adam Otstot, Heather Jackson, Meredith Kessler and Linsey Corbin. Listen in as they weren’t all that excited about the points system being modified and having to chase new targets to qualify for Kona. I dropped by Quintana Roo bikes for a factory tour and sit down with new IRONMAN world record holder Matt Hanson. QR are great bikes (despite some issues I had with components that they replaced for me when I dropped in) and Matt seemed like a cool customer. Hello swimming…. can we say wetsuit and down river swim!? I wish I was that fast in real life, but nothing helps the freestyle more than rubber and a current. I know I enjoyed the self seeded start, rolling start and only 25 minutes to get 1.2 miles. I’m pretty sure this swim time will stand for the rest of my life as a PR. After the swim warm up, I hit the road. It wasn’t like I remembered the full in 2014. The first 15 miles were uneventful and then it started wearing on me. No, not the hills. The chip seal roads and cracks every 4 feet. I was so worn out by being rattled for 56 miles. My back did NOT like that. For the full, I’ll probably look at a lesser inflation on the tires to soften the ride. There was some drafting, sadly. Couple of pace lines 5 to 6 riders deep passed at times and looked to have no intentions of spacing out or passing. Just zooming by having a great team ride. But, when you have 2500 athletes, some aren’t going to play by the rules. I also implemented my less is more in nutrition and more is more in hydration. My goal was to get just under a gallon of water in on the bike, half a bottle of sports drink and only took 1.5 GU gels. This was after breakfast 2 hours before the swim and clif blocks 45 min before and hot shot 20 minutes before the swim. 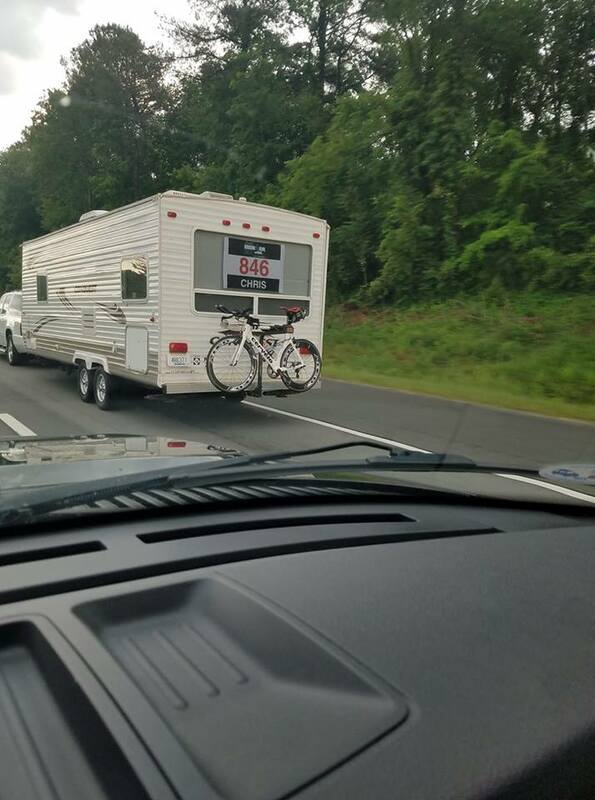 Also had a hot shot to start the bike. The plan was hydration, energy to make it through the run without needing solids and avoid sloshing and GI issues on the run. I knew the hills were coming on the run and heat was starting to be a factor by the end of the bike. While not blazing fast, it’s a solid pace for 13.1 miles after 1.2 swim and 56 miles on the bike. I hit my goal here to stay close to my 7:30 pace which slipped the last few miles and hill sin the heat. The big climbs conveniently were in full sun locations, keeping everyone honest and exposing those that had not prepared to make that run. I caught most of the bikers I was hop scotching with on the bike without a problem and made some serious headway. I was on pace for a sub 5, but with 4 miles to go, heat kicking up and more hills to come, I was relegated to holding whatever pace I could find and get to the finish. Not a PR technically with the 5:01 in Boulder, but the bike was 2 miles short in Boulder, but Choo is a down river swim. each in their own way helped me out, but the hills on the run for Choo were a lot tougher than the run around the Rez in Boulder. Equally difficult in their own right, so I’ll keep the 5:01 PR knowing I gave what I had for Choo (A effort) that with any past fitness, I would have taken longer. Had I raced Boulder with this fitness level, I think I would have easily been sub 5. Be ready for heat. It snuck up in a hurry on the run. Do some runs in the heat working on energy management and hydration. Focus on managing the excitement that will come out of T2 when you get off the bike and the crowds are cheering. There’s a tendency to ride the wave and then be walking by mile 7. Even energy flow out of T1 and T2. Get some hydration at the aid stations and walk them a bit to let everything settle. You have 13 miles to get all that energy out. If you do training indoors, practice being in aero as you would outside. Personally I had the saddle time, but not enough indoors was spent in aero and I paid for it with a sore back and having to get out of aero a lot to stretch the back on the fly. Dare I say that was the one point I could have saved more time for my sub 5. NUTRITION For Choo I only had the following: 700 calories overnight oats mix 2 hours before start time. Brought it and drank it after transition setup. Hot shot 20 min before start. clif blocks 45 minutes before start. Hot Shot in T1. 1.6 GU gels on the bike. Half a serving of gatorade packet on the bike. 24+ oz of water on the bike – enough that I had to pee 3 times Hot Shot in T2 1 dixie cup of Gatorade on the run + sipping water every aid station As you can see, that’s not a lot of calories. I depended on my breakfast for most of the race and supplemented a little during the race to avoid GI distress. Don’t get caught up thinking you need to eat a ton during the race. Obviously if you are out there for a bit, you will need a little more, but you’re body can only take in so much on the bike and run before you end up with a gut bomb. The roads are mostly chip seal and cracks = bumpy and momentum draining. Be ready on the flats to be peddling with some power to keep momentum. When training, think about the start and end of the ride and then subtract 10% of the energy you have left (probably more). That’s what you end up with on race day. Don’t race to 100% of your power. The bike is energy management and time to fuel and hydrate to set up the run. Don’t blow it by focusing on a speed or target split time. So many factors can change your bike time and speed. Be comfortable riding in groups. The course will be crowded on the bike loops. Run course… think Hospital Hill x 2 for you KC locals. It is draining to have to climb those hills. Take the hill runs seriously. Learn to manage the effort as you will be doing that 8 to 10 times over 26.2 miles in the heat. The last few years the heat was in the 90’s and it’s more humid than KC. BE READY and expect A HOT DAY. Hydration, pacing and energy management will be key between having a great race and dragging across the line looking for the med tent. I know… been there with a big fat DNF at Texas. Well, that’s a lot and about wraps it up. Any questions? Shoot me a note, comment on the blog, find me at www.SetThePaceTriathlon.com – REACH OUT!